Henriette Browne was the pseudonym for Mme Jules de Saux, née Sophie Boutellier (1829-1901). She specialised in genre scenes, especially Near-Eastern and religious subjects, as well as portraits. She also worked as an engraver. She started exhibiting at the Salon in Paris in 1853 and exhibited at the Royal Academy, London, between 1871 and 1879. 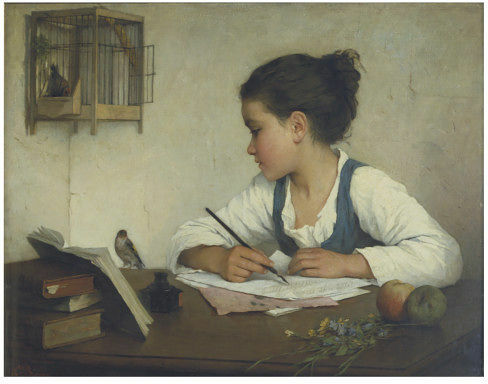 This painting is a fine example of Henriette Browne’s output as it combines a genre scene, a little girl distracted while doing her homework and a child portrait. The interest in everyday life and close observation of nature is characteristic of the French Realist movement emerged in the 1840s. Painting of landscape proportions, in oil colour on canvas, showing a girl seated at a table and writing. She wears a white blouse or chemise with long sleeves, beneath a sleeveless blue bodice with a scoop neck, and her curly dark hair is knotted at the back of her head. Her writing implements include a banker's pen, a bottle of ink, and a sheet of blotting paper, and she is apparently copying out a handwriting exercise from a book propped in front of her. Also on the table are two apples and a handful of wild flowers; a goldfinch is perched beside her on the table edge, and another is in the opened cage on the wall behind her. Historical significance: Henriette Browne was best known for her genre scenes and portraits of women and children. 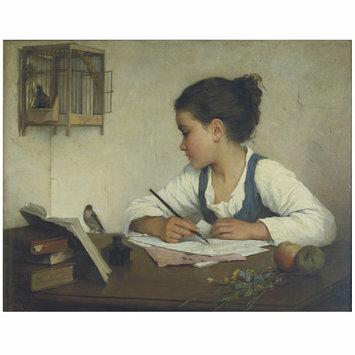 This painting is a fine example of her art as it combines a portrait of a young girl and a genre scene, the young girl being distracted by a goldfinch while doing her homework. 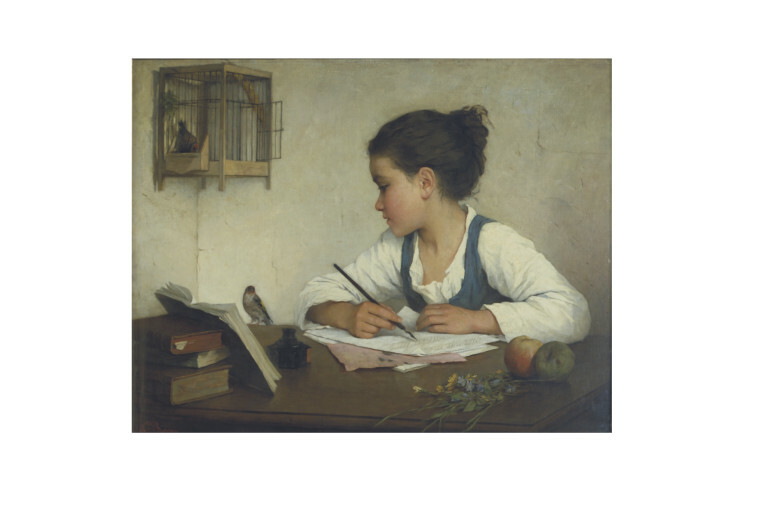 The twisted pose of the young girl, which reveals the basis of her neck, and her hand suspended over the page give the sitter an interesting gesture while she seems to engage a one-on-one conversation with the goldfinch who escaped his cage. The bird's cage can be construed as a metaphor for the imposed homework while the fact that it is opened alludes to the possibility of escaping such task by distraction. Birds in general are a symbol of freedom and goldfinches in particular enclose a Christian meaning as they embodied the soul of man that flew away at his death. Goldfinches were once a favourite pet with children thanks to his handsome plumage. In this regard, it is most likely that the present painting corresponds with the one entitled The Pet Goldfinch exhibited at the Royal Academy in 1875. This compositional idea provides the picture with grace and poetry, which enhance the innocent character of childhood. This type of pictures achieved extraordinary success with both French and English patrons. In his encyclopaedic work, Historia Naturalis, the ancient Roman author Pliny the Elder described the origins of painting in the outlining of a man's projected shadow in profile. In the ancient period, profile portraits were found primarily in imperial coins. With the rediscovery and the increasing interest in the Antique during the early Renaissance, artists and craftsmen looked back to this ancient tradition and created medals with profile portraits on the obverse and personal devise on the reverse in order to commemorate and celebrate the sitter. Over time these profile portraits were also depicted on panels and canvas, and progressively evolved towards three-quarter and eventually frontal portraits. These portraits differ in many ways from the notion of portraiture commonly held today as they especially aimed to represent an idealised image of the sitter and reflect therefore a different conception of identity. The sitter's likeness was more or less recognisable but his particular status and familiar role were represented in his garments and attributes referring to his character. The 16th century especially developed the ideal of metaphorical and visual attributes through the elaboration of highly complex portrait paintings in many formats including at the end of the century full-length portraiture. Along with other devices specific to the Italian Renaissance such as birth trays (deschi da parto) and wedding chests' decorated panels (cassoni or forzieri), portrait paintings participated to the emphasis on the individual. Portrait paintings were still fashionable during the following centuries and extended to the rising bourgeoisie and eventually to common people, especially during the social and political transformations of the 19th century. At the end of the 19th century and during the 20th century, painted portraits were challenged and eventually supplanted by the development of new media such as photography. Kauffmann, C.M., Catalogue of Foreign Paintings. II. 1800-1900, London: Victoria and Albert Museum, 1973, p. 15, cat. no. 40. Shaw Sparow, W., 'The Dixon Bequest at Bethnal Green' in Magazine of Art, XV, 1892, p. 161.